Pakistan can earn good by exporting milk and its products . HomePakistanPakistan can earn good by exporting milk and its products . Pakistan is the 4th largest milk producer but we lose million of litter per year just because of lack of knowledge technology . The genetics of the herds in Pakistan require a survey. This should have been done much earlier? It is ironic but that in 1937 the first cattle show was attended by the Viceroy and the steps taken to harmonized genetics with carrying capacity of land. The Dhanni came to the rain-fed areas. The buffalo in the more irrigated areas. The buffalo is now going to the northern areas, where it will compete with human consumption systems. The fodder for animal will vie with the wheat for humans. More efficient animals are now available and need to be brought into the production systems of this world. When will we do this? What delay us? Your guess is a good as mine when it comes to explaining human inertia. 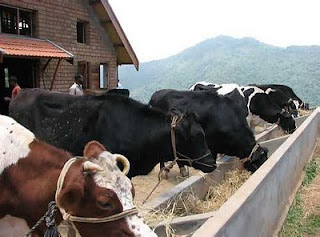 Livestock specialists are to understand the linkage between trade and aid. If Pakistan is to prosper then such goods as are possible to be produced here by our farmers there should be adequate arrangements for them to have confidence. If this production system is to survive then merely attacking the symptoms will not help. The cause(s) need to be tackled. Again it is so easy for the rich to bargain with outside commercial forces and so easy to reduce to ashes to work of your own already trampled farmer community. The edible oil industry is a case in point. The more one studies it the more serious are the issues that need to be resolved. No one likes competition for oneself. They all like if for others or where they can benefit. So that is how the game is to be played. And there should be no doubt in any minds that the competitive abilities once developed lead a country to ever higher pedestal. This can be turned around. The trick lies in imagination and imaginative involvement. The exponential experience must come to grips with one's judgement. That is difficult given our culture. Bureaucracy has to be reasonable. The problem of Pakistan has been strong bureaucracy in the past, it is now a weak one. Neither is an answer. The bureaucracy has to be reasonable one. Capable of taking decisions. Insidious and conceit never do. A non-descript decision-maker is a disaster for he comes to the job without any convictions. And therefore has much in him of negativeness. What is to be done. Much. Nutrition of the animals is dependent on the new interventions. Mort grass for supplementation where fodder is not available. One has to recognise. Taki Izono a naturalised. American for this intervention. The intervention in Balochistan of a Halophyte-Salicomia. Someone needs to explain why only 150 acres were cultivated when there was planning permission of 10000 acres. The silliness of things. The criminality of it all. Resolve the paradox yourself. In genetics I have already talked of more efficient animals. These are possible. The person who introduced teddy goats in Pakistan needs to be acclaimed. We have had no intervention thereafter. It is about time this is done. A team from International Livestock Research Institute (ILRI) will be here shortly. Their help can be sought. But there is still much to be learnt from the world and what they have done. Management practices have already been touched in great deal. Suffice it to say that the latest trends have not come to the livestock sector. Institutional obsolescence is visible. Both have to be modified to a great extent. The matter calls for not aping what is visible in this or that part of the world but developing a system which is the common heritage of the specificity's of our country. In management there are number of generic interventions that are possible. Demand management can have a very valuable and positive impact on our poverty implications. No amount of poverty alleviation can be done by external sources. The roots of poverty lie in our own system. Poverty is man made and if we are serious in its alleviation then there has to be a response which has to take into consideration questions of equity. Not much work has been done on this score. Not much is likely to be done in the future. There is just not enough awareness of the social deprivations of the downtrodden amongst our intellectual class. The intellectuals themselves are on the run. Still we must make do with what we have and evolve a methodology for achieving what we set out to achieve. More profound things will evolve in the course of times. A quick look at distortions must also be made. Just as this sector is fighting against unjust distortions, this sector must not seek distortions for its sector. Rather it should seek to find its own level in the economy. That will make it more self reliant. The economic effect of any undue benefit is always inefficiency. This can be seen from the cotton sector, to give just one example. Improvements can only come about by being. Are we to live from crises to crises in our food security endeavours? The answer lies in the attitude we bring to bear on our activities. It may be possible to live in a fools paradise but an optimistic fool cannot survive for long. Sooner or later the chickens come home to most? Sooner than later. Is lament in order. Or shall something be done. If you chose to do something then the option is to give not only a direction but speed to that vector. Only thus can be target group come up.